I open my eyes and see that it isn't quite light yet. So I close them again and watch the bright red cardinal strike a pose at the top of the maple tree. Share! he proclaims with a loud, descending slurred note, but what he means is that he definitely will not share our backyard with any other male cardinal. In the distance, a fluttering whistle announces that the woodcock is demonstrating his worthiness to a mate. I see the wind rushing through his specialized feathers that produce the sound as he drops out of the sky onto the ground. After he lands, he calls peent! in a nasal, buzzy voice, and a more distant male woodcock replies in kind. Will they both succeed in attracting mates, or, to the listening females, is one of them sexier than the other? A robin perchs on the trembling telephone wire and sings his long, repetitive song, Cheerily? Cheer up. Cheerily. 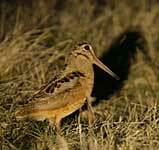 Before the sun rises, at least a dozen species of birds join the chorus. And I see them, every one, with my ears. An open window can be a revelation to a person who doesn't get up at dawn. The birds sing like mad on a spring morning, but most of the music is over by the time the sun rises. But whatever the time of day, the idea is to tune in to the sounds the birds are making. Each species makes sounds that are unique to itself, and you can identify the birds by those sounds just as easily as you can by their shape or color. There are advantages to birding by ear. You can do it in the dark (a useful skill for ident, as well as when you want to stay under the covers a little longer). The barred owl, for example, sounds competely different from any other sound you hear at night. Who cooks for you? Who cooks for you-all, it says. And although you can see with your eyes only in the direction you happen to be facing, you can hear in all directions at once, so you can identify a bird by its song even when it's behind your back. We humans live in a different sensory world from most creatures of earth. Your dog, for example experiences the world mainly through his nose, while our sense of smell is puny by comparison. It's difficult even to imagine the sensory impressions taken in by bats or butterflies, frogs or fish. Birds' strongest senses are sight and hearing, and they communicate by using visual and sound signals. Because we humans also rely primarily on the same two senses, we can tap right into the birds' world. I always enjoy watching the house wrens raise their families, but now I enjoy seeing them even when they are not in direct line of sight. Because of what my ears see, I'm often smiling at our baby house wrens, all vying to put their heads out of the hole in their gourd birdhouse at once and beseeching their mother with urgent raspy cheeps to hurry up with breakfast. As you begin to recognize bird songs, your own backyard will become a much more interesting place. For me, it was like gaining supernatural vision, being able to see through the leaves and around buildings. I was amazed at how many birds were all around me and how much I had been missing out on. Get a field guide to bird songs. Just as you need a book with pictures to learn what birds look like, you need recordings to learn what they sing like. Fortunately, there are many excellent tapes bird song CDs available now. When you hear a bird's song, describe it to yourself in words. You might notice that the red-breasted nuthatch sounds like a toy tin whistle. And that each note of the northern cardinal's song is a slippery, downward slurp. Or that the blue jay's call is sometimes loud and harsh, as if the bird were screaming Thief! Making mental note of such characteristics helps you recognize the bird when you hear it again. Associate a phrase of English with the song, such as Peter, Peter, Peter for the tufted titmouse. The words will remind you of the rhythm, speed, or pitch of the song. Fit your own words to a bird's song, or use memorable phrases others have discovered. The ovenbird sings Teacher, Teacher, Teacher! It's hard to improve on Quick, three beers! for the olive-sided flycatcher's call. Once you put words to a bird's song, the melody stays with you forever. Chicago no longer means just a city in Illinois to me. It also takes me back to the manzanita-covered mountains of the West Coast, where the California quail greets the morning with loud, ringing Chi-CAA-go! After you've become familiar with a few songs, make a point of listening early in the morning, especially in spring. During the hour before sunrise, many birds sing. The chorus is lovely to listen to as a whole, but it is also a pleasure to single out and recognize the individual voices in the choir. Some birds sing throughout the day, but you'll hear 100 times as much bird song first thing in the morning as at noon. At any season, you can see more birds with your ears than you can with your eyes. So why not give it a go tomorrow morning? Sleep with a window open, so that you'll hear the birds singing when you first wake up. If you don't know what they are, try to separate out one song from the rest. Even though the singer may remain a mystery to you for a while, it will serve as your inspiration to learn to see with your ears. © 2008-2012 by Diane Porter. To know the birds, a field guide (bird book) is essential. Answers to questions from real people with real questions about how to choose a binocular. Michael and Diane give practical, name-naming tips about what binocular will meet exactly your need. Closest focusing? Inexpensive enough to give to a young child? Best binoculars in the world? Least expensive good binocular you can buy? It's all here, in The Binocular Advisor. And you can play the song right off the book! One other thing we love about the iFlyer — it comes with an extra set of bar codes you can stick in your field guide, turning it into a song guide, too!